Before 730am today I already knew that this was going to be a crazy week. And I found myself not even being able to get excited about thoughts like "I wish it was Friday already." Friday might be the craziest day of my work week. But the craziness is expected from time to time and certainly right now as we get ready to launch our event season. I've been hyper aware of how this time affects me emotionally because of the memories of my father and his time in the hospital. As a result I've created this 30 Day Challenge (which I'm really digging). Well during the times where work is crazy busy, I recognize that I need to be just as diligent about taking my own time during the day. 4. Make dinner for me and Steve-o. I have a tendency during these crazy times to put my time and my commitments last. Although it's almost 10pm and I just really finished working for the day, I still had lots of moments for myself. It's nice to know that I've evolved somewhat in the past year or so and can take that time and not feel badly about it. Oh and one more thing. 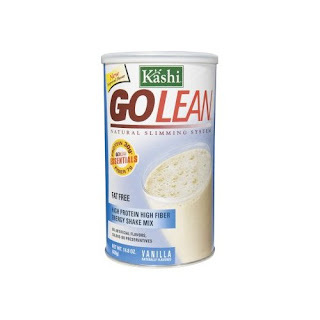 At Trader Joe's last week, I threw this Kashi Go Lean Protein Shake mix in my cart on a whim. I have been meaning to try it for almost a week now and finally tried it today. I was very skeptical that it would be able to keep me full for very long or that it would taste all that good. And I'm happy to report that it was delish! It tasted like uncooked cake batter...you know if you're into that type of thing and it really did keep me full as if I had a complete meal. I like and I recommend!